Fall down a rabbit hole to enter a fantasy world populated by peculiar characters and big wins. Pokies.com features games from a dozen game developers. Biggest of them all is Microgaming, whose new game Alice in Wonderslots is another big-budget game with fantastic graphics and tons of heart-rate increasing slots action. 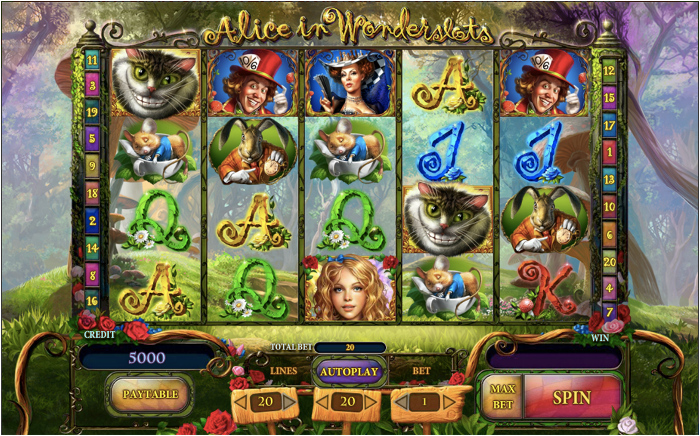 Alice in Wonderslots is a five reel, twenty payline slot machine based on Alice’s Adventures In Wonderland (Pokies.com editor’s note: far from the only Alice inspired game btw, for another take on Alice’s adventures in a slot form you can play Alice And The Red Queen and a few other games). You’ll find all the famous characters from Alice’s adventures in the game. Cheshire Cat with its winning grin is a wild symbol, which substitutes for any normal symbol giving you big wins. Alice herself is an in-reel bonus symbol, which expands to the top. Each two symbols that Alice covers wins you the amount of your wager for this spin. After a winning spin you can try to double your winnings in a game of risk with the Queen. Click or tap on Gamble after a winning spin and you are taken to a game of risk. A card is drawn for the Queen and you need to choose one of four face-down cards: pick a higher card and your winnings are doubled – but pick a lower card and you lose your winnings. If you have nerves of steel you can double up to 10 times in a row to multiply your winnings by a whopping factor of 512! Join Pokies.com now and you’ll get $/€/£5 free + a deposit bonus of $/€/£800 with 50 free spins. You can use your free fiver to play Alice in Wonderslots or any of our more than 350 PC and mobile slot games.